Gasherbum I viewed from base camp in the late morning as moisture begins to accumulate in the air before the storm. Today, we woke up at 7:30am, had breakfast in the mess tent and enjoyed/resented the fine morning weather (it was yet another perfect summit day). 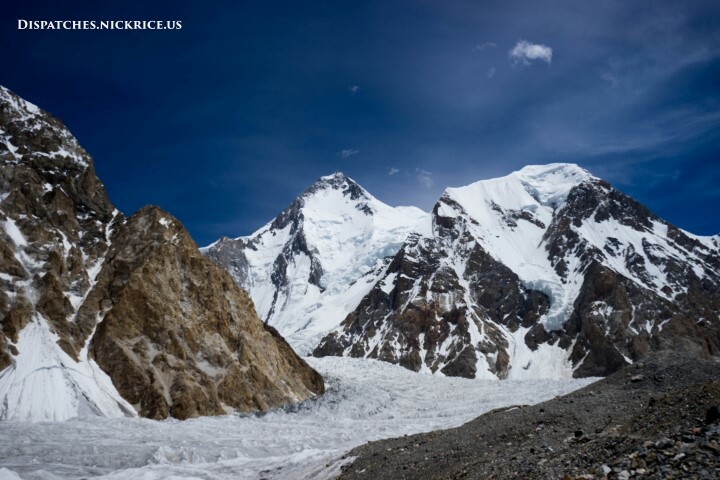 Later in the morning, we received word that one of the Polish climbers who was attempting to ski down Gasherbrum II had vanished below Camp III. The two skiers had contacted their base camp staff to let them know to expect them for breakfast in base camp. While descending from Camp III on Gasherbrum II, one of the pair triggered a small loose snow avalanche, made a few turns, then fell into a crevasse below Camp III. In the afternoon, a group of liaison officers came to our mess tent to coordinate whether there would be a helicopter rescue. The information they had was simply that the skier had vanished somewhere below Camp III (there were conflicting accounts in base camp; mine is from an eye-witness) and with such general information, they decided that a helicopter fly-over would be of little help. They contacted their headquarters to report the missing climber, then left. The rescue effort for the moment will be coordinated by the climbers already in Camp I. Until we know more, we can do little from here to help, as we would not be able to arrive safely to Camp I till tomorrow morning. One of the high altitude porters was dispatched to help with the rescue effort, but as of yet, no one has asked for help from any of the climbers here in base camp.